Race car lunch box for pre-school toddler. 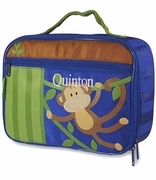 Race off to preschool with lunch packed into a fun bag with a race car theme! 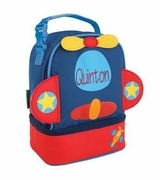 The bag is made specially for little ones and features two cars on the front panel, one with a fiery design in red and yellow and the other in green and orange. Checkered flags in black and white mark the start of the track and race cars run off and around the sides. The design of the bag is neat and simple with a handle and a main compartment that opens and closes with a zipper. 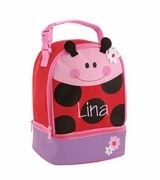 Perfect for packing a sandwich, a drink and some treats to eat at lunchtime.